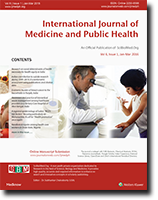 S. Sharma, Gupta, V. Kumar, Jain, A. Kumar, and Chakravarti, A. , “Are anemia and blood group types related to Japanese encephalitis and dengue?”, International Journal of Medicine and Public Health, vol. 5, no. 4, pp. 328-331, 2015. M. Elsayid, Al-Qahtani, A. Mesfer, Alanazi, A. , and Qureshi, S. , “Determination of the most common morphological patterns of anemia among Saudi anemic patients attending King Abdul-aziz Medical City-Riyadh”, International Journal of Medicine and Public Health, vol. 5, no. 4, pp. 301-304, 2015. S. Kumar, Jeganathan, J. , and Miryala, L. , “Left ventricular hypertrophy in chronic kidney disease”, International Journal of Medicine and Public Health, vol. 4, no. 4, pp. 364-366, 2014. R. V. Sabale, Kowli, S. S. , and Chowdary, P. H. , “Prevalence of anemia and its determinants in urban school-going children of Mumbai”, International Journal of Medicine and Public Health, vol. 3, no. 4, pp. 325-329, 2013. N. S. Deshpande, Karva, D. , Agarkhedkar, S. , and Deshpande, S. , “Prevalence of anemia in adolescent girls and its co-relation with demographic factors”, International Journal of Medicine and Public Health, vol. 3, no. 4, pp. 235-239, 2013.